Located in the old cellars of the house, for 6 - 8 people, kitchen-dining room with fireplace, three bedrooms, two bathrooms and a beautiful terrace with barbecue of 40 m2. In total they are 140 m2. All in stone and wood of the same style as Casa Leandrón. Each house is independent. For groups of more than 8 people consult Casa Leandron for 12 people. 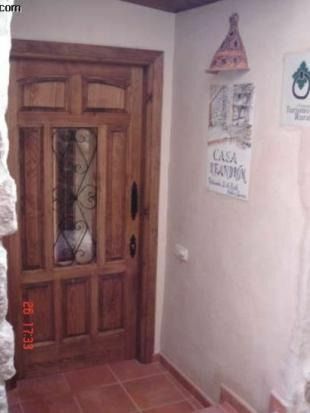 In both houses there are board games and infomacion of the area include sheets, towels and free wifi. Located in the center of the town of Murillo de Gállego, population of just 100 inhabitants, in the heart of the Kingdom of Mallos, gives us the possibility of great contrasts, rafting, kayaking, hydrospeed, canoraft, paintball, via ferrata, descent of ravines, hiking, Romanesque routes, mycological days, visits to wineries in the area, raptor observation and an important gastronomic offer. Just 4 minutes away on foot is our adventure company www. alcorcerafting. com .. we have important discounts for all those staying at Casa Leandrón. We reserve the activities for you without any additional cost. - Casa Leandrón consists of: - Kitchen-dining room with fireplace and dishwasher (dining table of 2. 70 meters) -Living room with television - 6 double rooms (three of them have double beds) - 4 bathrooms (two of them inside rooms) with hair dryer - A lovely terrace with barbecue and summer furniture, ideal meals and dinners - Casa Leandrón II, located in the old cellars of the house, recently restored in 2005, it consists of: - 3 double rooms (for 6-8 people) - Living room - fully equipped kitchen with dishwasher - Two bathrooms with a hairdryer - A lovely terrace with barbecue and summer furniture. - Option of extra bed and cot (ask). Possibility of booking the two houses for groups of friends or large families. Ask us, Free wifi in both houses. In Murillo de Gallego, we have our own activities company www. alcorcerafting. com with discounts for all staying at Casa Leandron.